Infrared thermography is a proven method for identifying and defining hidden moisture problems within an insulated flat roof system. By using infrared thermography, the trapped moisture or wet areas under the roof surface can easily be pinpointed and marked with paint so that repairs to the roofing system can be made surgically. By marking the problem areas directly on the roof surface, those repair areas can be seen by anyone standing on the roofs after the survey is performed. This highly effective process can save you money because you now can repair AND not replace the entire roof system. Plus, besides prolonging the roof life, you are also keeping unwanted roofing and insulation waste out of the landfill. During the day, the sun radiates energy onto the roof and into the roof substrate, and then at night, the roof radiates the heat back into outer space. This is called radiational cooling. 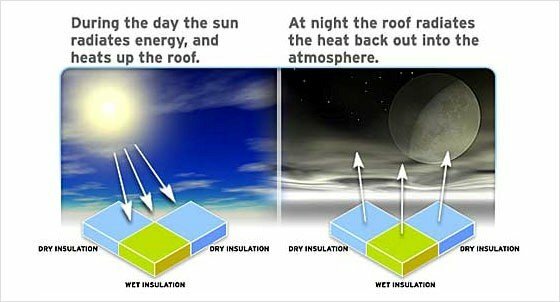 Areas of the roof that are of a higher mass (wet areas) retain this heat longer than that of the lower mass (dry areas). Infrared imagers can detect this heat and “see” the warmer, higher mass areas, during the “window” of uneven heat dissipation. Roof leakage is pretty simple . . . Most leaks occur where the waterproofing termination is sealed or where there is a roof surface penetration. As water enters your roof through the waterproofing layer(s) by tears, cuts, poorly sealed penetrations, failed flashings and caps, the insulation below can become laden with water and trapped in the roof substrate. If left in disrepair, the concrete deck absorbs or traps water, the wood deck rots, the metal deck rusts, and water intrudes into the building’s interior. Infrared thermography is useful in locating these moisture intrusions. Puget Sound Infrared, we create detailed, high-quality and easy to understand reports documenting roof moisture. A roofing professional can then use the information to verify the wet areas and then recommend cost-effective removal and replacement of ONLY the wet and damaged components, thus correcting the problem areas without the tremendous expense of replacing the entire roof system. With the average lifespan of the typical commercial or industrial roof being 7 years, regular inspections and a proper roof maintenance program are recommended if the owner wishes to properly maintain the roof. With the help of infrared technology, the roof lifespan can be increased by as much as 300%, resulting in significant savings for the owner.